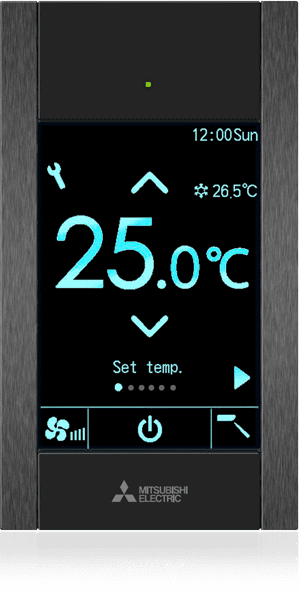 The full colour touch controller enables the control of both residential and commercial air conditioning applications PAR-CT01MAA. 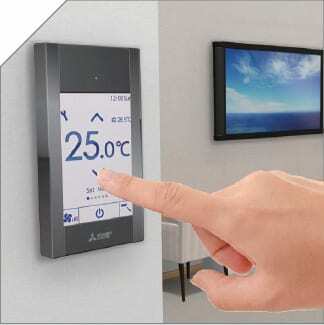 Its customisable 3.5 inch LCD colour touch panel that makes it simple to use. Available in white or premium black finishes to suit any décor. Big visible sized icons on the 3.5 inch full colour touch panel display. Operation panels are easy to see and a breeze to use. Custom logo images can also be displayed on the initial screen for a more customised user-friendly experience. 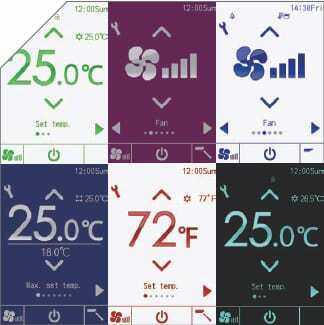 180 different colour patterns can be selected for control parameters or background on the display. Users can also customise the panel to display the certain paramaters which is handy for places such as hotels; displaying only the basic settings (ON/OFF, set temp., fan speed etc). The Remote controller can communicate with tablet or smartphone via Bluetooth Low Energy (BLE). Operation and Setting App are available from the App Store. 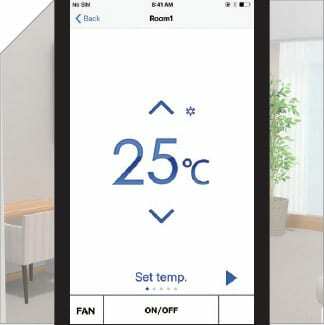 The smartphone app can operate the air conditioner and displayed in the language that the user's smartphone is set to. The initial setup can now be performed in advance on a smartphone, with the settings transmitted to the remote controller by enabling BLE transmission upon entry to the room. See our Full Range of Mitsubishi Air Conditioning Split Systems. Plum Heating & Cooling is your Specialist Mitsubishi Diamond Dealer in Melbourne as well as an Authorised Service Agent for Mitsubishi in Melbourne’s West. Call Plum Heating & Cooling on 8360-9622 or click here to Request A Quote for a Mitsubishi Electric Aircon for your Home or Office now. "Plum did both my ducted gas heating and evaporative cooling about 3 years ago, they were professional and efficient and I have had no issues. I finally got around to getting a service done this week and again very professional, Ian the technician was very polite and got on with the job quietly and efficiently. Thanks Plum"